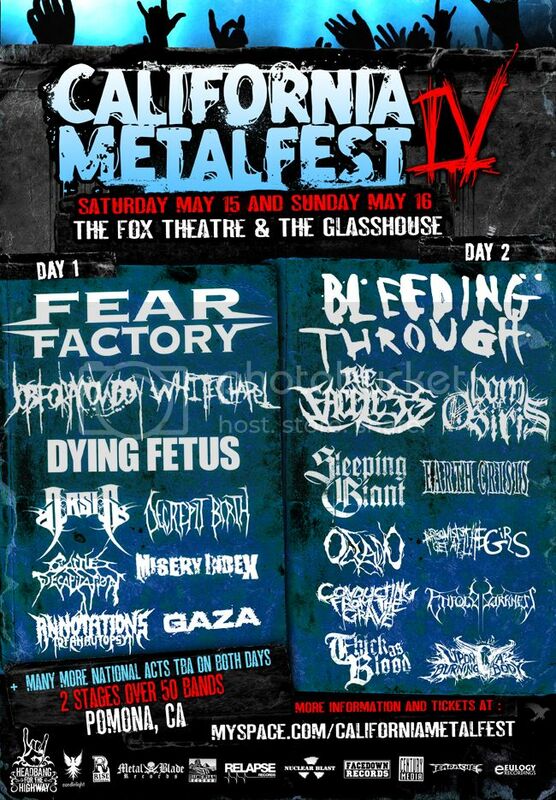 FEAR FACTORY and BLEEDING THROUGH will headline this year’s California Metalfest IV. The fest has been expanded to two days; the fest will take place May 15 and 16 at The Fox Theatre and The Glass House, both in Pomona, California. “Hello All we’ve got some good news and bad news. The bad news is that we’ve had to drop off of the remaining dates on our US tour with SATYRICON due to some personal / family business that must be attended to immediately. Thank you for respecting our privacy. “The good news is that we can now officially announce that BLEEDING THROUGH is the surprise special guest for our friends in TIGER ARMY on Halloween Night in Orange County! We’re going to help them close down their four-night ‘Octoberflame‘ event in style by sharing the stage on Halloween Night at The Grove Of Anaheim! Get tickets HERE!. TIGER ARMY sold out The Grove last Halloween so you should try to get your tickets right away. “Rest assured that everything is fine as far as THE BAND is concerned! We’re looking very forward to the Halloween show followed by the creation of our BRAND NEW ALBUM, which we can tell you will take place in December and January before our European tour with MACHINE HEAD, HATEBREED and ALL SHALL PERISH! That’s right, NEW BLEEDING THROUGH album in 2010! “We are very excited about our first album with Rise Records. We’ve got a lot of material and we’re anxious to hit the studio in December and get it out to you in the first half of 2010! Norway’s SATYRICON have announced a 24-city headlining tour of North America which kicks off September 25th in Baltimore, MD. Support will come from BLEEDING THROUGH, CHTHONIC, and TOXIC HOLOCAUST (through 10/10). To coincide with the tour, SATYRICON will be releasing a special edition 2-CD set of its latest album, The Age of Nero. Bonus material includes 8 live and rare recordings never before available in North America. This edition drops September 29th. SATYRICON have announced that they will be returning to North America for a headlining tour this fall. The tour will be rounded out by BLEEDING THROUGH, CHTHONIC, and TOXIC HOLOCAUST. DARKEST HOUR, the Washington D.C. metal quintet, will be releasing their fifth full-length record, The Eternal Return, on June 23rd through Victory Records. The album was produced by Brian McTernan (SENSES FAIL, THRICE, FROM AUTUMN TO ASHES) and recorded at his Baltimore, MD-based Salad Days Studio. Guitarist Mike Schleibaum comments: “To put it simply, this is a metal record made by dudes who have dedicated half of our lives to aggressive, unrelenting music. Prior to its release in the states, DARKEST HOUR will head over to Europe on the Thrash and Burn Tour, co-headlining a stint with BLEEDING THROUGH, with support from BENEATH THE MASSACRE, CARNIFEX and more. Following their European jaunt, the band will head out in support of NECROPHAGIST and SUFFOCATION on the Summer Slaughter 2009 Tour. Check out www.Fangoria.com to win tickets for the Summer Slaughter 2009 Tour. MARILYN MANSON and SLAYER‘s 25-city co-headline North American tour will kick off on July 25 in West Palm Beach, FL, pillaging its way cross-country to wrap up in San Antonio, TX on September 1. Confirmed dates are below. For this two-pronged-threat double bill, SLAYER and MANSON will each play full sets with BLEEDING THROUGH and one other support band, yet to be determined, opening all shows. MARILYN MANSON just wrapped up work on his upcoming June 5th release to be titled Eat Me, Drink Me. Celebrating its 26th year together, the always-uncompromising SLAYER will be promoting their latest album, Christ Illusion – which debuted at #5 on Billboard’s Albums Chart.